Roadhouse Coffee. Bodega Bay, CA. All photos by Megan McCrea. I come from a family of caffeine addicts—of the “don’t talk to me until I’ve had my morning coffee” stripe—and my mother will settle for nothing less than espresso. Freshly ground, piping hot, mixed with meticulously steamed milk and dark chocolate to create an irreproachable mocha. While traveling recently in Bodega Bay (population: 1,077), sating Mom’s craving posed a challenge. We Googled. No Starbucks. No Peet’s. No Philz. We struck out to find espresso the old-fashioned way: by asking at the tourist office. The kindly attendant pointed us to Roadhouse Coffee. 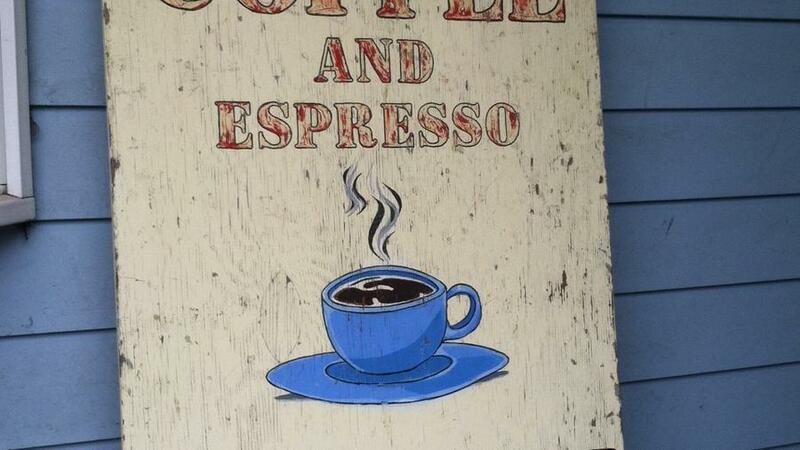 Outside the shop, a worn wooden sign promised “great coffee and espresso.” Judging by the sign’s age, I wondered what, exactly, we would find inside. We opened the door and stepped straight from nondescript strip mall parking lot into…Bodega Bay’s living room. Near the window, a pair of locals sat chatting in overstuffed leather armchairs. At a table, a couple read the local paper over cappuccinos. A customer talked fishing with the barista at the counter. Glancing toward the door, I saw a rack of Bodega Bay postcards sharing wall space with guitars of various sizes. Near the counter, maracas and a musical triangle hung above the shop’s simple menu, hand-lettered on a board. To my (pleasant) surprise, the menu featured all of the coffee shop staples—coffee, latte, mocha—and then some—cubano, Mexican mocha, steamers. As the barista made our mochas, he explained that the shop’s owner, Jim, travels around the world and collects things. Jim’s best finds make their way to Roadhouse Coffee (1580 Eastshore Rd., Bodega Bay; (707) 360-8856). While the espresso machine squealed, my eyes drifted—from a glass case filled with shells and pottery; to a bulletin board packed with notices for voice lessons and meditation retreats; to a wooden shelf packed with ukuleles, tambourines, and bongo drums. Oil paintings and photos covered the walls. Coffee and a pastry at Roadhouse Coffee. With our drinks in hand, we settled into a table near a bookcase. Jim’s eclectic tastes were evident here as well, as Clive Cussler novels sat cheek-by-jowl with Dr. Seuss books, the Oxford Shakespeare, the Encyclopedia of Mystical and Paranormal Experience, and back issues of Surfer magazine. Even after we’d finished our drinks and pastries, we hated to go. It felt like leaving an old friend.